Detail, Givenchy Fall 1996 advertising campaign. Image: eBay. For a while I’d wondered about Vogue 1887, a tailored, mock wrap jumpsuit. Caveat emptor: an unscrupulous online dealer has been selling V1887 as Alexander McQueen, but the pattern appears in Vogue Patterns magazine prior to McQueen’s first Givenchy show in January 1997. 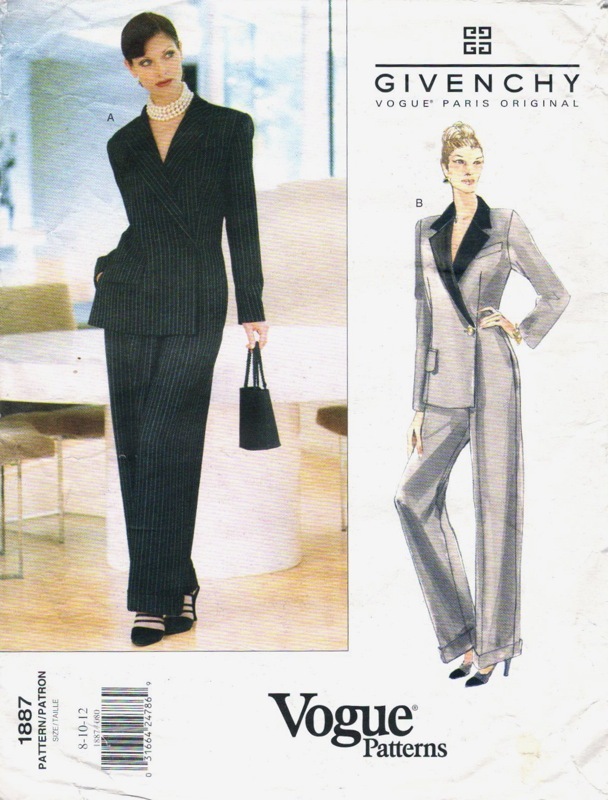 My copy is copyright 1996 and, although the fabric requirements weren’t yet available, Vogue 1887 was first shown in the November/December 1996 issue of Vogue Patterns Magazine, in a trends forecast on jumpsuits. By the January/February 1997 issue it’s featured in an editorial. Vogue 1887 by John Galliano for Givenchy (1996) Jumpsuit. Here’s the envelope description: Misses’ jumpsuit. Loose-fitting, straight-legged, cuffed, mock wrap, partially lined jumpsuit has self or contrast collar, shoulder pads, upper welt, flap, lower welt pocket, side seam pockets, concealed front pleat/zipper and long, two-piece sleeves. Flannel jumpsuits, Givenchy by Galliano Fall 1996 RTW. 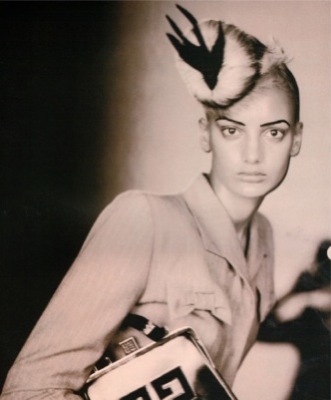 Nadja Auermann in John Galliano’s suit (and black montera) for Givenchy Fall 1996 RTW. “All in one, a bustier jumpsuit in white-striped grey tennis flannel. To be worn with an ivory silk cape, Givenchy.” L’Officiel no. 807, August 1996. Photo: Bruno Bisang. Image: jalougallery.